When is the best time to take Plusbiotic? Can I take Plusbiotic with other supplements? How long does it take for Plusbiotic to work? Can I use Plusbiotic while I am taking antibiotics? Does Plusbiotic contain Gluten, Dairy or Soy? 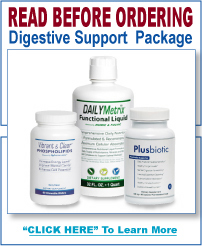 Probiotics are medically referred to as a group of “friendly bacteria”, or “microflora”. Probiotic bacteria favorably alter the intestinal microflora balance, inhibit the growth of harmful bacteria, promote good digestion, boost immune function, and increase resistance to infection. People with flourishing intestinal colonies of beneficial bacteria are better equipped to fight the growth of disease-causing bacteria and pathogens, and inhibit the negative effects of constant antibiotic overexposure. Plusbiotic contains 3.4 billion CFU’s of 100% complementary microflora and spore-germinating probiotics per capsule. To stimulate the growth and activity of the probiotics, IMO, a non-digestible fiber derived from organic tapioca, has been added as a prebiotic. In addition to beneficial microflora, Plusbiotic also contains a powerful enzyme blend designed to clear yeast and other unwanted debris out of the intestinal tract, making Plusbiotic much stronger than competing yeast cleanses on the market. Plusbiotic is the only of its kind, containing prebiotics, probiotics and an enzyme blend all in one capsule. Plusbiotic uses spore germination technology, a revolutionary new process that delivers probiotic spores rather than living bacteria. Probiotic spores are dormant life forms that protect the bacteria from acidic conditions, as well as extreme heat and cold. These spores, along with the potent probiotics, attach themselves to the inside of the intestinal mucosa and begin to germinate, allowing for complete microflora colonization. In addition, the enzyme yeast cleanse will help to break down any dead fungus or toxic materials remaining in the intestinal tract, allowing for a complete eradication of unwanted debris. Various strains of candida are naturally found in the human body. With healthy levels of microflora, these yeast strains live in perfect harmony within the intestine, however, poor diet and other factors can cause candida overgrowth. Some doctors argue that 60 to 80 percent of the US population may be affected by an overgrowth of Candida yeast. Eventually, these yeast strains can begin to turn “parasitic”, robbing our bodies of our resources for their own benefit. Over time, Candida can begin developing plantlike roots that penetrate and attach themselves to the inside of the intestinal wall. These roots can dig deep enough to cause permeability (leakage) in the intestinal tract and allow toxic material to flow into the blood. Candida is comprised of an outer protective protein layer and primarily cellulose and N-acetyl-glucosamine (Chitin) under it, making it very difficult for the body to break down and eliminate naturally. Plusbiotic contains a powerful enzyme blend necessary to strip away the protective protein shell and begin digesting the cellular infrastructure of the Candida. Do I Need To Take Plusbiotic Forever? Does Plusbiotic Need To Be Refrigerated? Is Plusbiotic Vegetarian or Vegan? The microorganisms used to produce this enzyme product are not genetically engineered organisms as defined by the National Organic Standards Board. Genetically engineered is defined as follows: Made with techniques that alter the molecular or cellular biology of an organism by means that are not possible under natural conditions or processes. Genetic engineering includes recombinant DNA, cell fusion, micro-and macro-encapsulation, gene deletion and doubling, introducing a foreign gene, and changing the position of genes. It shall not include breeding, conjugation, fermentation, hybridization, in-vitro fertilization, and tissue culture. Is Plusbiotic Generally Recognized as Safe (GRAS)? Yes, the specialty blend of enzymes and probiotics that make up Plusbiotic is Generally Recognized as Safe (GRAS) by the FDA.